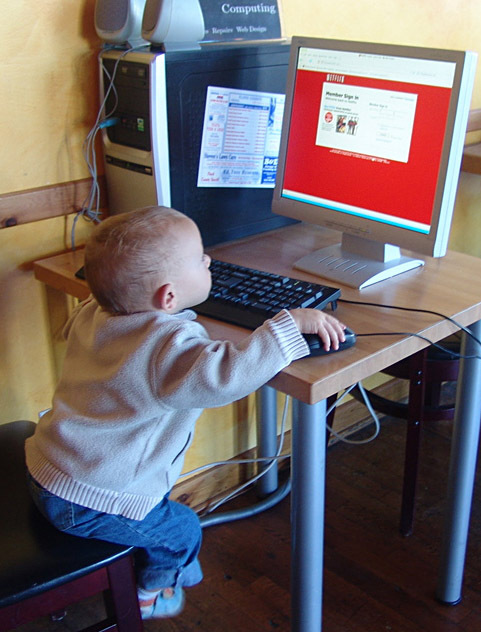 Do children come prewired for Internet access now? I ask because, in Floyd, it often seems like anything is possible. Porter is one and half years old. When I saw him at the computer at the Cafe Del Sol, I was taken aback at his certainty. 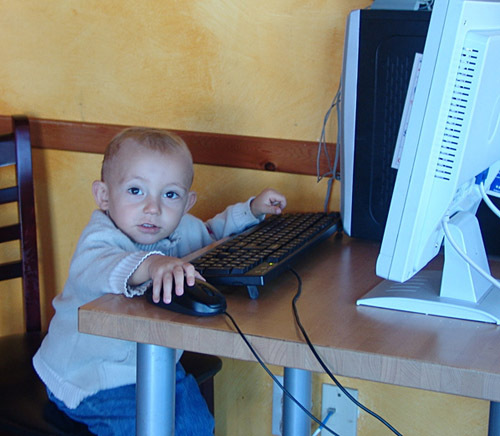 I asked his mother if she thought this was his first lifetime using a computer. Meanwhile, Porter made a determined effort at logging in on Netflix. This entry was posted in Seen around Floyd and tagged Children on the Internet, Floyd Virginia. Bookmark the permalink. 0 Responses to Do children come prewired for Internet access now? Ha! Very cute kid. Good photos. The answer is elegant in its simplicity: Children are not pre-wired for the Internet; the Internet is pre-wired for them. It is the very essence of stimulus-response simplicity. Children are pre-wired for stimulus-response, the simpler the better. But I know exactly what you’re talking about as far as *watching* young kids using the innernets. Especially regarding this thing called “certainty.” It’s really hard to keep the above in mind when you watch them, it looks like they’re the ones who built it. Part of that is, if the whole thing crashes and the data is lost forever, the little boogers lose nothing. When we grown-ups hesitate, we’re consumed with worry and fear over the prospect of having to re-type something. The other thing is something that should concern us greatly: As we live together, establishing and reinforcing these protocols that have to do with interacting with each other, what we’re learning is antithetical to making use of computers which are logical things. So children do have an advantage over the rest of us, through their inexperience in these regards. In that sense, you are right. They are pre-wired to possess “computer” skills that those of us more seasoned have polished off. And when they’re one-to-two, it is spooky as hell to watch.